Pinterest is one of the most fascinating – but frustrating – tools if you are a blogger. It is simply a treasure trove of information, tips, recipes and can be a crazy good place to increase your blog traffic. However, managing Pinterest can be a lot of work. In order to have Pinterest work for your blog, it requires pinning pretty regularly. And honestly, that is something most of us just don’t have the time for. Luckily, there are a number of tools that can help you manage your Pinterest account. Today, let’s talk about my favorite – Tailwind (this is an affiliate link meaning I get a discount on Tailwind each month – I only recommend products I use and I gladly pay for Tailwind – it’s amazing!). Tailwind is a Pinterest marketing and management tool. What does that mean? It means that you can create and navigate a calendar of your pins – enabling you to drag and drop pins and making it easy to pin in batches. One key thing that sets Tailwind apart from other tools – it is one of the official Pinterest partners. What does this mean? It means that Pinterest works with their partners to make publishing content easier – meaning that the tool will work seamlessly with Pinterest. You can read more about that here. I would not use a tool that was not an official Pinterest Partner. So what does Tailwind allow you to do? Schedule pins. This is huge. Tailwind allows you to drag and drop pins into time slots that are automatically queued up based on what will cede the best results. Additionally, if you are pinning something you’ve already pinned, Tailwind will tell you that and tell you when and where you pinned it last so you can decide if it’s time to pin it again. Also – using Tailwind’s features like board lists and interval scheduler (more on these features in a future Eat Pray Run DC newsletter) make it even easier to pin a number of pins in a short amount of time. Monitor your Pinterest analytics. I use Tailwind exclusively to manage and monitor my analytics – I don’t get that information from Pinterest anymore because it’s all there within Tailwind. So convenient. Expand your content by offering suggestions of similar pins. After you pin something, you will see a screen that suggests similar pins. This is a great way to find new people on Pinterest and to help fill up your queue with other great content. Create tribes to help promote your content. I will also be talking more about tribes in a future newsletter (you can sign up in my sidebar), but essentially these are groups of like minded folks who agree to share and promote each other’s pins. Manage multiple Pinterest accounts. This is a feature that I do not take advantage of because I only have one Pinterest account, however if you have multiple accounts, then I think this would be absolutely huge. 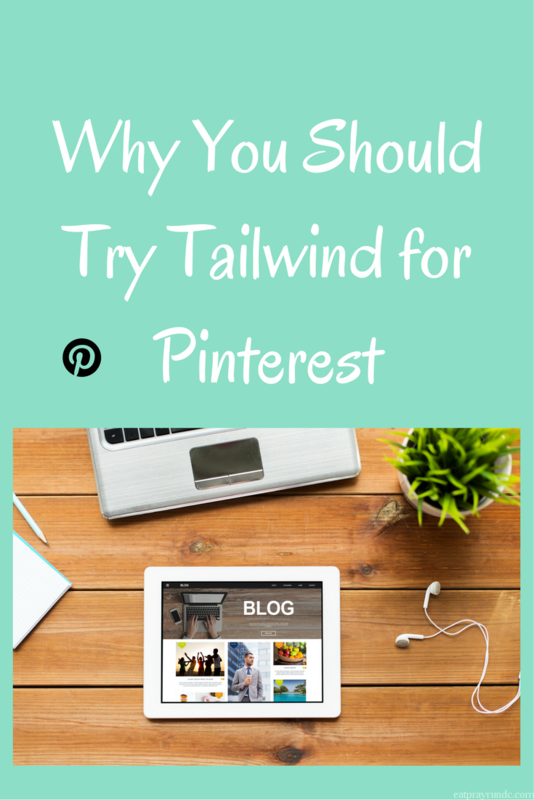 I really love the ease of using Tailwind and it’s a big part of my Pinterest strategy. Basically, it is my Pinterest strategy, haha! I’d love to what other tools you use to manage your Pinterest account. Share in the comments! I”m still trying to figure out Pinterest. I really need a tutorial. And time because my boards are a disaster. I have a couple short tutorials here on the blog you can check out. I’d start by just playing around with it when you have a couple minutes! I just finished writing a post about Tribes that will go live tomorrow – great minds, right?! I really only use it for number 1 so I know I probably should be doing more with it. There is so much neat stuff on Tailwind but I do think it takes some time to learn. Tailwind is amaaaazing. I love the Tribes and try to schedule as many posts as possible to keep my queue full! Yes – it’s so great. I spend maybe 30 minutes every week and keep my queue full for the next few weeks. It’s awesome!